Bonner Springs – Page 282 – Welcome to Wyandotte Daily! The National Agriculture Center and Hall of Fame, Bonner Springs, will close its doors temporarily this season, according to an announcement today. “The Board of Directors believes that this is an opportune time to regroup and rethink the Center’s future,” said Jody Albers, president of the Board of Directors. “Our balance sheet is strong, and our board of directors and partners are committed to a bright future,” Albers said. Event and daily attendance have grown substantially over the last several years. The previous staff and leadership have done a tremendous job, but without continued private funding the board has had to make a tough decision, Albers said. The National Agricultural Center and Hall of Fame will be completely reimagined in the months ahead, she said. The facilities and grounds will play host to a variety of events throughout the year. Temporary volunteer or part-time staff will be made available for scheduled events. The facility offers a variety of spaces for rent and will continue to do so during this period, she said. Staff will attend to the upkeep of the buildings and grounds and the preservation of the collection. Maintenance of the buildings and grounds will continue as usual. The community and patrons will be able to visit the website to get updates and to express thoughts on the future, she said. 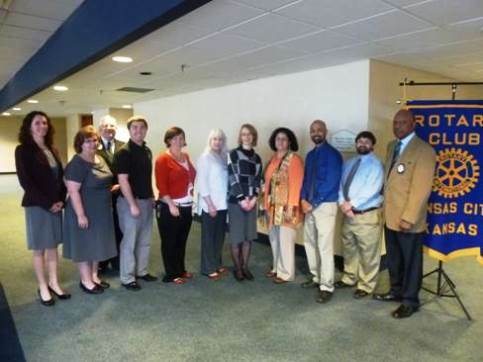 The Kansas City, Kan., Rotary Club, at its April 29 luncheon, recognized outstanding teachers from each of Wyandotte County’s nine high schools. This is an annual program of the Kansas City, Kan., Rotary Club to show appreciation to teachers in the county that represent the best of the community, a spokesman said. The teachers were introduced by their school’s administrators and were presented a plaque of appreciation by the club. A spokesman for the club said it was grateful to the teachers who give of themselves to educate and prepare youth for the future. To learn more about Rotary International, go to www.Rotary.org. Visit the Kansas City, Kan., Rotary Club’s website at www.rotarydowntownkck.org.